Helen Kuhl is Editorial Director of Imaging Technology News. Welcome to our newly launched website, providing news and information for medical imaging and radiation oncology professionals. Whether you are a returning visitor or someone coming to our site for the first time, you will find the improvements with this relaunch make it easier than ever to access our comprehensive resources for the imaging community. • Breaking news, technology developments and regulatory updates, featured front-and-center and updated daily. • Video center and webinars — With an enhanced viewer, our itnTV library has more than 100 videos featuring technology demos, interviews with industry leaders, show reports and more. • New technology — Timely info about product introductions, works-in-progress and FDA clearances, plus our extensive database including almost 5,000 products and services. • Case studies, white papers — An in-depth look at select subjects. • Buyer’s guide — A comprehensive database with contact information for hundreds of vendors, searchable by company name, product category or alphabetically. 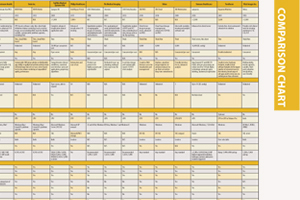 • Comparison charts — Comparison charts with detailed specifications for dozens of products from major manufacturers are in an easy-to-access format. • Dedicated information channels — Accessible via the top bar for key segments like women’s healthcare, imaging, information technology, radiation oncology and molecular imaging, these channels present all related resources on the website in one location. • Blogs — ITN editors as well as industry experts share opinions and insights. We invite you not only to read the blogs, but also post your own thoughts about any subjects related to imaging. • Comments throughout — The site is now an interactive community, where you can post comments or questions about articles or news items and initiate dialogue with your peers. I invite you to start here and share a comment about our new website. Let us know what you think and how we are doing. Although this new site culminates hundreds of hours in development, it will keep evolving in response to your suggestions for ongoing improvement. We welcome your feedback and hope you will visit us often!